Phillips Zoom Whitening is the number one requested in-chair whitening treatment, with over 10 million patients using Zoom whitening to whiten their smile and increase their confidence. dhealth Dentistry is a trusted provider of Zoom tooth whitening technology, and we are experts in the application of professional-strength whitening of Zoom teeth whitening. For a limited time, we are offering the Zoom tooth whitening treatment for just $595. Usually priced at $795, this special offer means you’ll receive the revolutionary in-chair whitening treatment, as well as upper and lower take-home trays and a tube of top-up whitening gel for an amazing $200 less than usual. Best of all, your teeth will be up to eight shades whiter after just 45 minutes! If you’d prefer to opt for the take-home Zoom Whitening kit (instead of an in-chair treatment), one of these kits will cost you $350. What is the cause of your discolouration? There are many causes of teeth discolouration. For example, typical dietary stains from food/drink/tabacco, previously root-canal treated teeth, medication related staining e.g. Tetracycline staining, previous trauma to a tooth affecting the nerve, etc. 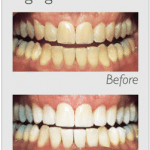 It is important to understand that teeth whitening does not work the same for all types of stains and discolouration. Typically whitening works best at brightening teeth that contain a yellow tinge than teeth that has a grey, brown or black shade. Are there any underlying dental issues that can make the whitening procedure unsuitable or prevent it from working? There are many conditions that has to be treated as priority before any cosmetic treatments. e.g. Dental decay, chronic inflammation and infection, large build-up of stains or tartar, severe gum disease, extreme teeth sensitivities etc. We simply need a good foundation before we start whitening procedures. At dhealth, our friendly dental professionals will be able to identify the cause of your discolouration, treat any underlying dental pathologies and tailor a program for you. Once we determine that you are a suitable candidate for Zoom whitening, the rest of the consultation process will be centred around your comfort. The advantage of the Zoom professional teeth whitening is that we can set the intensity to a level you’re comfortable with. We will also incorporate desensitisers to protect the enamel on your teeth and minimise any sensitivity or possible pain. Whitening does not work as effectively if plaque or tartar is present, so regular professional clean is the key to keep your teeth pearly white long term. With this concept in mind, dhealth offers a bespoke Whitening for Life Program to help ensure that your pearly whites stay sparkling for the long-term. All you need to do is book a hygienist appointment with us every six months. During this six-monthly check-up, one top-up tube of Zoom take-home Whitening gel will be given to you entirely for FREE!, in order for you to keep your teeth shining year after year, all at an affordable price point. The quickest, easiest way to effectively whiten your teeth is in-chair treatment with Philips Zoom WhiteSpeed. Zoom WhiteSpeed is the only in-office system that has variable intensity setting so each treatment can be customised to maximise patient comfort. The system also includes desensitisers to help minimise sensitivity and protect your enamel. This dentist-supervised, in-office procedure is safe, effective and clinically proven to whiten up to eight shades—for a brighter, whiter smile in just one in-office visit. Philips Zoom is only available at a dentist’s office to ensure optimum safety, and comes in different treatment types and strengths to fit your lifestyle and sensitivity. Take a look at some of the ‘before and after’ shots below. With so many different whitening products on the market, it’s easy to get confused. So, in an attempt to eradicate as much confusion as possible, here are the answers to some of the most common questions you may have. Does Zoom teeth Whitening hurt and is it safe? 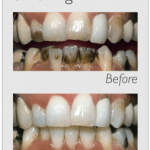 Zoom teeth whitening is incredibly safe, and numerous clinical studies have shown that carbamide and hydrogen peroxide are both safe for use, if the product is applied by a dental professional. However, we generally advise pregnant women and new mothers to avoid teeth whitening as the chemicals from the treatment has the potential to enter the placenta and breast milk. The whitening procedure itself is typically painless, there is no need for any injections or anaesthetics. However, small proportion of patients can experience some mild sensitivities during or after the procedure. We advise all patients to avoid icy cold food/drinks for a couple of days. But rest assured, this cold sensitivities usually subside within 24-48 hours, and is the only short-term side-effect known after whitening. Should extreme sensitivities/pain occur, which is highly unlikely, relief can be found by taking some over-the-counter anti-inflammatory medication like Ibuprofen for such rare occasions. Of course we are also here to help anytime at dhealth for any concerns. Why should I opt for Phillips Zoom over an over-the-counter option? 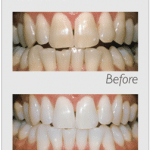 Phillips Zoom can be completely tailored to your whitening needs and goals. Over-the-counter options cannot be customised, and the trays that are used to bleach the teeth can be ill-fitting and lead to gum irritation and damage. In addition, all teeth whitening products sold over the counter in Australia may not contain more than 18% carbamide peroxide, or 6% hydrogen peroxide. Some over the counter product simply don’t even label their concentration. If the product contains higher concentrations, you will carry a great risk of chemical burns. For your own safety, it is still best to leave it to a dental professional. How long does it take and how long will it last? 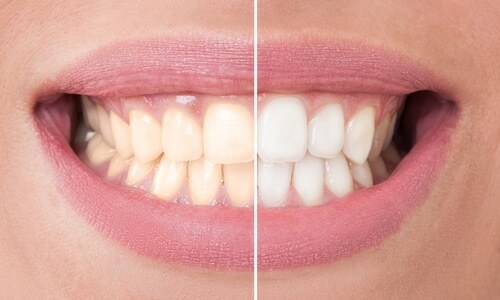 The Zoom whitening process only takes 45 minutes. However, to protect your gums, our dental professional will put a protective barrier around all your gums to shield it from any potential chemical irritation, making the entire procedure taking up to 60-75min. But after just one appointment you will notice a considerable difference in the lightness of your teeth. It really is the fastest way to whiten your teeth, and that’s why dhealth has made it one of our central cosmetic dentistry treatment options. Stains are commonly caused by lifestyle-factors such as diet, particularly soft-drinks, coffee and alcohol as well as tobacco consumption and aging. Your lifestyle will influence how long the treatment works for, but maintenance whitening or top-ups will prolong the effects. Why Opt For Zoom Tooth Whitening? At dhealth Dentistry, we believe that Zoom tooth whitening is a holistic treatment option, because it helps our patients to improve on an aesthetic and mental level. We love watching our patients walk out of our office with renewed confidence, and we know you’ll be 100% happy with your decision to invest in our Zoom professional teeth whitening procedure. What is the dhealth ‘Whitening for Life Program’? Our Whitening for Life Program is simple and affordable. All you need to do is book a hygienist appointment with us every six months. At these visits, you’ll receive one free tube of take-home teeth whitening gel. 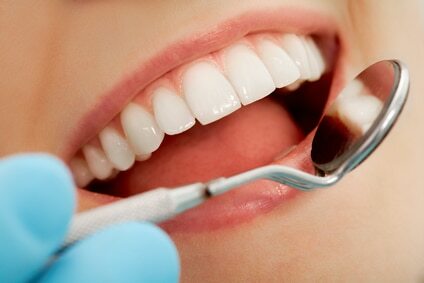 Teeth whitening does not work as effectively if plaque or tartar is present on your teeth. So, a regular professional clean (followed by teeth whitening) is key to keeping your teeth pearly white long term. During your six-monthly check-up, one top-up tube of Zoom take-home whitening gel will be given to you entirely for FREE! These regular whitening top-ups will help to keep your teeth shining year after year, all at an affordable price point.